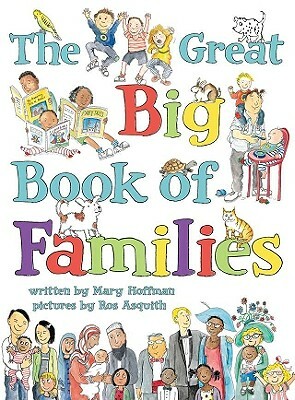 The Great Big Book of Families by Mary Hoffman, illustrated by Ros Asquith. Ages 4-8. Dial Books for Young Readers, 2011. Unpaged. Review copy provided by my local library. This book celebrates all kinds of different families! Some children live with their mommy and daddy. Some children live with just their mommy. Some children live with their grandparents or with two daddies or with a foster family. And the book continues in this vein, exploring different kinds of homes, different parental employment situations, different celebrations, and much more. The illustrations represent people of many different races and ethnicities in pretty much all family combinations you could possibly imagine. Older children will love poring through the pages, noticing all the funny details in the illustrations. For younger children, you might choose one spread to look at and talk about the topic on that page. Look at the spread on siblings, for instance, and talk about whether or not your child has siblings and whether they all get along. This is a great addition to the books available on different kinds of families, a topic always in high demand at my library. It will find a home in units on families or all-about-me and it's a great conversation starter. How is your family the same or different from the families in this book? Pair this one with Todd Parr's The Family Book or Peter Spier's People. It's Nonfiction Monday! Check out the round-up over at The Simply Science Blog! Librarians Read Over the Summer, Too! 48-Hour Book Challenge, Comin' Right Up!